The conflict in Colombia has created situations of forced displacement for many rural communities. People’s lives are torn apart as the different actors involved in the country’s conflict struggle for control of territory and resources. Most of these displaced people (almost 6 million) remain internally displaced (remaining inside Colombia’s borders); the neighboring countries they attempt to flee to do not recognize them as refugees. Ecuador has made some steps towards the recognition of Colombian refugees, however, and currently hosts about 55,000 Colombian refugees. At the same time, there are no internal displacement camps within the borders of Colombia. So, where do these people go for support and survival? They must seek shelter on the margins. They often end up in places with little access to housing and other necessities, on the outskirts of cities. In southern Bogota there are many neighborhoods that have been built at the edge of the valley, often climbing into the mountains. The people who live in these communities are often those displaced from the conflict, those looking for better economic opportunities in the city, and those that can no longer afford living in the more “formal” areas of Bogota. In this area, just outside of Bogota’s border, lies Soacha, a municipality of the department (equivalent to a state in the USA) of Cundinamarca. Many people (somewhere between 700,000 and 1 million) live in Soacha. A great number of these have been displaced from elsewhere in Colombia. Struggling to rebuild their lives and hold on to their dignity, they have built up some incredible community associations. We had the fortunate opportunity to visit one that IELCO is partnering with in the neighborhood called Buenos Aires, ‘Centro de Atencion Integral al Adulto Mayor’ (Comprehensive Care Centre for the Elderly). It is a place where the elderly, living in difficult conditions, lacking many services and unable to work can come for many things. They receive comprehensive health check-ups and care, are provided therapeutic activities, offered literacy training, and provided meals. Spending just a short day at this center left us intrigued to learn more, especially as some of the elderly members offered to tell us their stories and further our understanding of the context of Colombia, the context we are now working in. 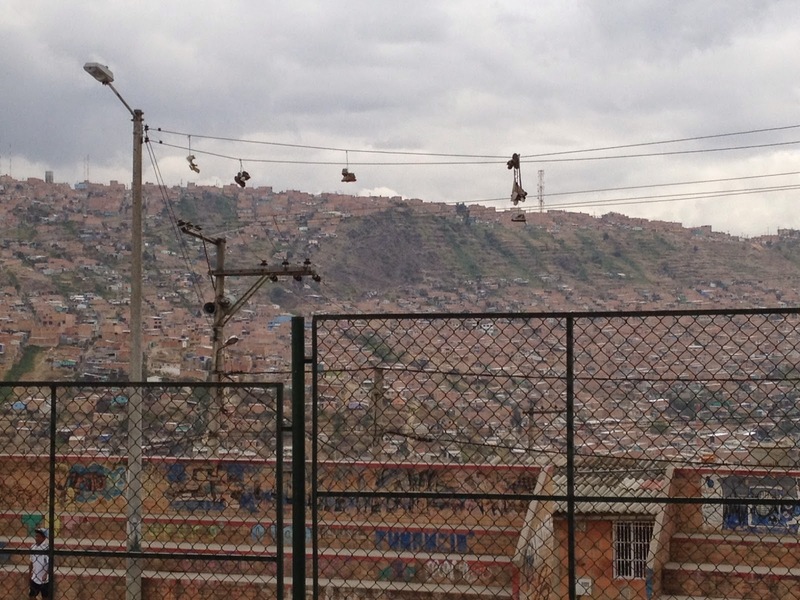 Still in southern Bogota, but in Bogota’s city limits, lies another community working to build itself up out of situations of displacement and poverty. This community, called Caracoli, is in the locality of Bogota called Ciudad Bolivar (one of twenty localities of Bogota). Ciudad Bolivar is made up of 320 neighborhoods, of which 100 are considered illegal. Meaning they do not have title to the land, permission to construct houses or contracts for services to be provided. This means that people living in these “illegal” neighborhoods do not have security of land or housing. They could be forced to leave (again) at any moment. 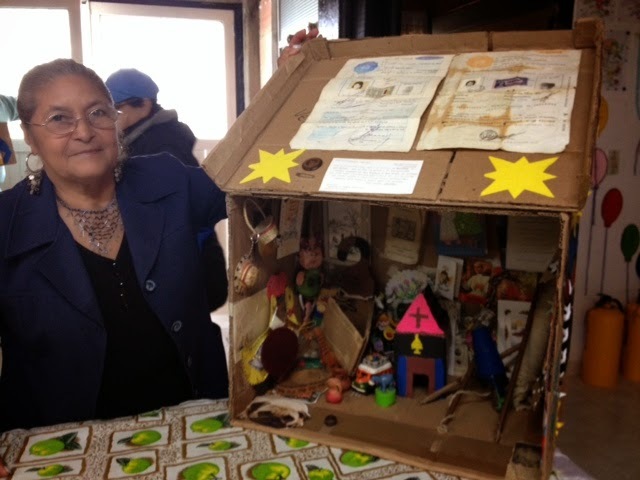 A congregation of IELCO, called Luz y Vida (Light and Life) has been in the neighborhood of Caracoli for 15 years. Last week we were able to visit a women’s group that organizes there. This group acts as a solidarity fund, creating voluntary savings plans and providing small loans for the women members. It also creates a safe place for women to come together and discuss community issues and how they affect women specifically, as well as learn skills (sewing classes were underway when we visited), professional psycho-social support and emergency help are offered as well. 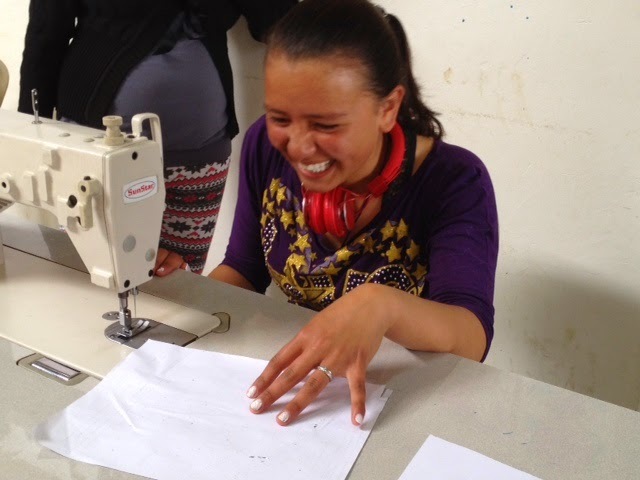 Flor using a sewing machine for the first time (practicing on paper), lots of laughs! These snapshots we were able to witness last week, gave us a glimpse into the types of projects we may have the opportunity to accompany. Offering our companionship and support to the people we have met so far, people involved in beautiful struggles for dignity, community, and reconciliation, is more a privilege than a service.